There is so much to cover, today! Grab a cup of something lovely, kick back, relax and enjoy the show. Above, you'll see the preview for the mini album's previous cards. You can get ALL of the cards so far onlast Saturday's blog. The link for today's card is attached to the image, above. Just click on the preview and it will automatically download. Speaking of hybrids, I've got a very talented new team member joining The Cherry. It's Nancy from the Nickel Nook. Clickhereto see her latest blog using our products. She's designed this beautiful card using our Au Naturel kit. You can find it in either one of our shops. You can find all of Nancy's links to her social networks on her blog. Saturday's are usually geared towards hybrids, but every other month there is the Love For Layout Templates hop around. We've got another splendid round of free templates for you and it will be the last for this year. I'm fairly certain we're keeping the train going for next year, too. I played with the template in my very, very glitchy, most unstable software program, Photo Shop Elements 14. Double and triple ugh to all of the greif this program has been causing me, lately. I saved it as a tif, twice. I always, always do and especially since the program has been so unstable, lately and when I went to crop in my photos, there were no layers. So it saved as a tif, but left me no layers! I'm not savvy enough to figure this one out and I already put a lot of time into the page, so I'll show it to ya anyway. I used Holly Chic from Melissa Bennett at the Sweet Shoppe. I have not taken down all of the links from previous trains. Go back and see what other great free templates you can find. I've got more free templates in our scrap-a-licious group on FB in the challenges albums, under photos. Do all 12 challenges and receive a nifty gifty the end of December. You've not much time left! If you are all about the templates, then you are in the right spot! 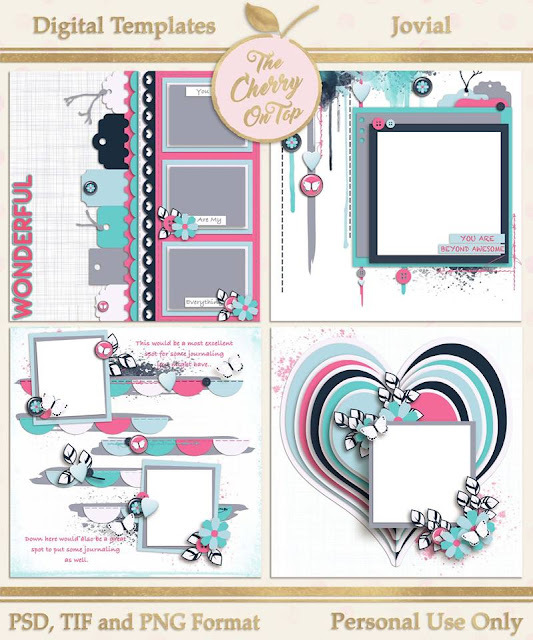 I design mostly digital scrapbooking templates. Here are a few of my favorites. I invite you to visit with Kreative Design Studio(On Etsy) or Scrappy Sisters. I just put these, Butterflies Are Free templates in the shop at Scrappy Sisters.Blessingsfrom Made By Keuntje kit were great for these templates. See how I just turned the paint streaks? Total gorgeousness from Tammy Miller and Aimee Harrison. Find it here. Fun goodies from the Sweet Shoppe Designs. Here is the previous and next spots for the train. If ya get lost, hit up Jodi's blogfor all the stops. Leave your pretty pages in ourpublic group! We blog at least twice a week on a pretty usual basis so please come back for more. Welcome to the roller coaster of creativity and ups and downs of all of this crafty craziness. According to my agenda, we are supposed to be on #41. According to what I posted last week, we are #40. So #40 is here, today and I'll give ya the links to all of the previous cards to make double sure you have them all. Here are the blank cards. You are totally set now with reason 1-40 and the blank cards. Whoo hoo! Thanks for your patience and your participation. I'm thrilled you are joining in on the challenge. If you are new to The Cherry, I invite you to go back and see all of the fantastic things you've missed so far. This site is full of fabulous free stuff and so is my old blog. If you like what you see and you don't want to miss out, join the newsletterand the group. The madness has started with what is a capitalist's dream! Hehehe...I do appreciate the sales this time of year and of course I don't need much of an excuse to give you a great deal so I'm in, too. Pop over to one of my shops and enjoy 50% Friday and Saturday only. If you forgot what Cut It Out looked like, here it is. and here are a few pages I designed with it. I also gave away a free taste last week with this quick page. The link is still live. Here are some pages from some very talented Scrappy Sisters. As I mentioned, you can totally use the png, white outline of these templates in your cutting machines. The one with the scribble circle might be a bit tricky, but a few ladies did manage to do it! Whoo hoo! Here's a traditional example for you. Pretty cool, eh and certainly very versatile. Now, a few peeps asked me to give more layers on my cuttable templates so that's what I did with all of the rest of the templates I designed after these. I'm going to make as many cuttables files as I can from these kinds of templates. I've got a nifty start in the shop, Kreative Design Studioon Etsy. Go check them out! I've got some pages to show off with more fantasticness from around DigiLand. Throwing Some Scraps Around has an awesome new kit out, Be Of Good Cheer. You know me. I like to show off the many sides of a kit or collection. Here's my page showing off the glitter and glamour in this kit. I LOVE these colours together! I adjusted the background paper for a touch more contrast. I used Jodi's scatter for an anchor as well whimsical, reach out and touch the magic, on the top. I made some simple word art and clipped in one of Jodi's papers so it matched perfectly and gave a bit of texture. The polaroid frames are easy to make. Copy your background, size it to the size you want, then use the marquee tool to cut out whatever spot you want from the photo. Duplicate your plain background or anyone really and layer it behind the frame for your photo and crop in your pic. Boom! Done! I use these techniques all of the time. Especially, when there is no frame that suits my needs in the kit or collection. Here's the more jovial, fun and whimsical side of, Be Of Good Cheer. Wow! Those ugly sweaters matched this part perfectly! Hehehe...I hosted the Ugly Sweater party last year. Though not everyone was up for it, they all played along and I have a feeling that some of them even ended up enjoying it. There sure were a lot of laughs. What were the chances that such a small party, someone would have the same sweater?! Hehehe...Oh! This is from the template pack, Butterflies Are Free. So here is yet another page with Butterflies Are Free templates from the Pre Sale pack and a gorgeous new collection from Aimee Harrison Designs about family. Isn't it so pretty?! Those torn papers are lovely! Jodi from Throwing Some Scraps Around is sponsoring your freebie, today! She said it'd be ok for me to give you the page I designed as a free quick page. Isn't she a doll?! Here are some more nice freebies from around the web. My gal Andrea totally linked a sister up! Y'all! I was just told by the store owner that Scrappy Sisters is having server issues. Terrible timing, right?! I've went in and put my Kreative Design Studio shop on sale for 50% throughout the entire weekend. This is such a bummer and I apologize for any inconvenience. I'll tell ya what...if there is something in the SS shop that isn't in my Etsy shop, I can still get it to you if you contact me. I'm on European time and hosting a special needs party this weekend so it might take me a bit to get back to you. E-mail to lmtroch@excite.com if you have questions or requests or if you're in our group, you can contact me via Facebook, too. I'll be back tomorrow with your next, free printable card for your, Why I Love You mini album. We're back with your next free printable Why I Love You card. Whoo hoo! I've also got a few shots from that digital to traditional/hybrid kit I've been working on using The Kit Cart Designs, Never Grow Up kit. It's not as bad as I thought it would be. I will tell you that my girlfriend who was here during the fussy cutting, turned up her nose at my tedious precise work. Hehehe...Her and her fancy cutter! Hehehe...Seeing how all digital kits come with png images for the embellishments, most people will be able to use those pngs in their cutting machines. I'll be back to take you through the exact process later, but thought it was worth showing you that you could even print out the embellishments you want and cut them by hand, if you wanted. Keep in mind that the inside parts will be difficult to impossible so limit or eliminate the elements that would be too difficult. I'll show ya what I mean. I used a png ripping action from Lisa Rosas to get individual pngs of my page I designed. This way they are the exact size I need. Then I placed the elements on a blank page, 8x11 and printed them out. Use good, rigid paper with a gloss or slight gloss for the best results and so that you won't damage the embellishments when cutting. If you look carefully at the very top of my pile of cut outs, you'll see the very tiny Captain Hook. There's no way I can cut out all of that white around him. He's not really essential on my page anyway, but most of the pieces were pretty easy to cut out. An exacto knife might be helpful, but ya gotta be really careful with those. I'll come back to show you the progress. I had a round up of freebies yesterday. If you're into that, you may want to go and check it out. We've got new templates in the shop and they are so sweet. I've kept frames in mind and there are several pages with multiple photos. I did a bit of a twist on what basically is Project Life styled templates for two of the pages. It's a nice mix of templates when it comes to the number of photos and cluster options. Keep reading for page inspiration and alternative ideas and get a wrap up of our most recent freebies and a throw back. Have you noticed that a few of these pages contains some of the same goodies? That's because many of us scrappy sisters have been scrapping away with Made By Keuntje's new kit, Blessings. Meet this adorable owl family and admire the lovely, seasonal, warming cozy colors. This first page is Jodi's and she used the new templates. The next two are mine. How about all of this luxurious gold with just a tiny pop of pinky purple. Look at us all hiking through the German mountains! Hehehe...You just know we dealt with a bit of the teen bored antics. At least we could lure them further with the promise of pizza and hot cocoa. Hehehe...I myself, kept my mind on the beer. Hehehe...I used some awesome new templates fromBits N Pieces. If you watched thevideofrom last week, you've seen this page. This is Aimee Harrison Design's new collection, Sew Brilliant. It is so fantastic. The colors are beyond awesome and I love the sewing theme. What a great way to give your pages a cozy, hand made, crafty feel. You are going to love it! My gal Ngoc, has done yet another, fun, bright page with her little cuties. More goodies from the Sweet Shoppe, of course. This is my template, Good Times. Find it here. Have you seen the new Commercial Use edges from the Pixel Scrapper Blog Train for November? I didn't know so many people liked edges! Hehehe...It's so nice to get all of those lovely comments. Let's see what you do with these. This is Dana's contribution to the same train. I am loving those lights and the flakes. This was our new freebie from last week. We also put out this lovely cuttable. You've only got just over a month to do all of the challenges in our scrap-a-licious group. Get on over there and get scrappy. If you have a page in all 12 albums by the end of December, you're going to get a nifty gifty. You just know it is going to be good!